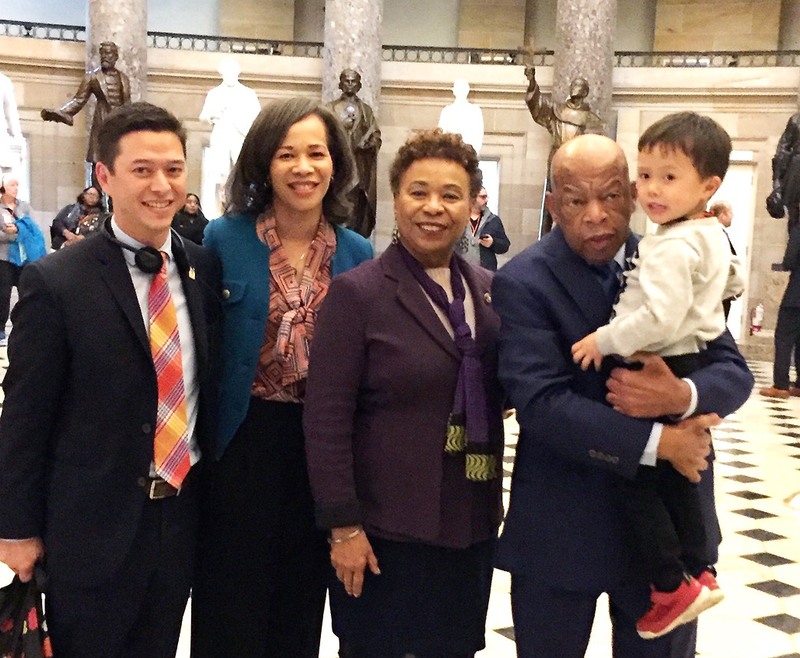 From left: Alhambra Mayor Jeff Maloney, Rep. Lisa Blunt Rochester of Delaware, Rep. Barbara Lee of Oakland, civil rights icon Rep. John Lewis of Atlanta, and Maloney’s son Koji in the Capitol Rotunda. 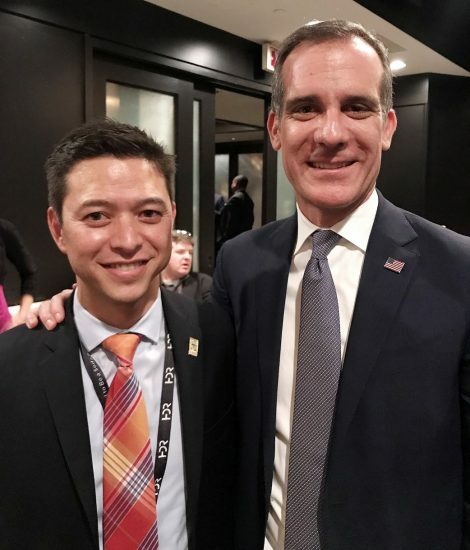 Alhambra Mayor Jeffrey Koji Maloney was among about 250 mayors of cities with populations of 3,000 or more who attended the U.S. Conference of Mayors (USCM) 87th Winter Meeting at the Capital Hilton Hotel in Washington, D.C. from Jan. 23 to 25. “I have been extremely impressed with the two USCM meetings I have attended,” said Maloney. “The high attendance figures and the depth and quality of the speakers and presenters speak volumes about the role mayors play in our country. Alhambra Mayor Jeff Maloney and Los Angeles Mayor Eric Garcetti. Other scheduled speakers included Mayors Robert Garcia of Long Beach, Gleam Davis of Santa Monica and Steve Benjamin of Columbia, S.C., president of the U.S. Conference of Mayors; Treasury Secretary Steven Mnuchin; gun control advocate David Hogg; and four possible Democratic presidential candidates — former New York City Mayor Michael Bloomberg, Sens. Cory Booker of New Jersey and Jeff Merkley of Oregon, and former Colorado Gov. John Hickenlooper. “It was also great witnessing Los Angeles Mayor Eric Garcetti accepting a grant of $150,000 for his ‘Universal Play’ program to combat childhood obesity,” said Maloney. “I participated in several breakout sessions and heard excellent panel discussions on cities’ efforts to become carbon-free in the near future to combat climate change and the challenge of affordable housing at the municipal level. Other Asian Pacific Islander mayors registered for the conference included Steven Ly of Rosemead, Peter Chan of Monterey Park, Richard Sun of San Marino, Victor Manalo of Artesia, and Tri Ta of Westminster from Southern California; Karyl Matsumoto of South San Francisco, Rich Tran of Milpitas, Lily Mei of Fremont, and Raymond Buenaventura of Daly City from Northern California. Participants also discussed immigration policies, new transportation technologies, and the U.S.-Mexico-Canada trade agreement. Maloney was elected to the Alhambra City Council in 2016 and began a nine-month term as mayor last year.